Images and text by Carter. There’s something extraordinarily engaging about a book with no words. And there’s just something plain old extraordinary about this particular one. 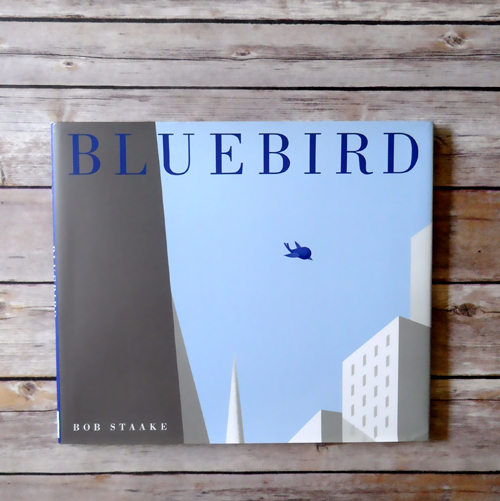 Bluebird, by Bob Staake, is a story that will sweep you into a fierce friendship and shatter your heart into pieces when that friendship is tested. But before you turn the last page, that bursting heart of yours will get all patched up. It’s understated and overwhelming all at once. Because there are no words, the story unfolds visually. The panels are jam packed with joy and surprise and simultaneously weave a gentle call for empathy. One boy, quiet and alone. One bird, insistent on friendship. It’s a tough story, but its truthful – and so, so beautiful. P.S. – Tell me, do you have any favorite wordless picture books? Gabrielle and I are both big fans of this one by Jerry Pinkney, and I adore anything and everything by Barbara Lehman! Oh, I don’t know Robot Dreams! I’ll have to check it out. If you live near Powell’s consider me jealous! Our kids adore Wonder Bear by Tao Nyeu. I bought it for the gorgeous colors and illustrations that seem to pop off the page and both our children love it for the endless possibilities of stories that they can dream up. So far no two interpretations have been exactly the same. 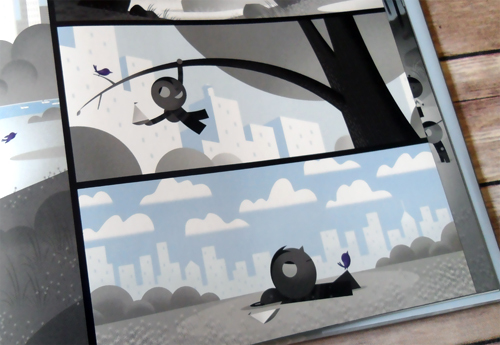 I love that about wordless books. And Wonder Bear! I met Tao Nyeu at a book signing once and she was just as lovely as her art. So intricate and zen all at the same time. Thank you for this introduction! I am eager to read this with my girls! I love getting recommendations on this topic because these books allow kids to “read” before they are actually literate. Some of our favorite wordless picture books are _South_ by Patrick McDonnell and _Wave_ and _Shadow_ by Suzy Lee. I love Suzy Lee! Have you seen her newest book with author Jesse Klausmeier, Open This Little Book? She’s so inventive! I haven’t seen that book yet! Thanks for the tip! Where’s Walrus by Stephen Savage. Definitely a favorite! Oh! We love this one, too. Such a great story and such great illustrations! How prescient! We checked this out from the Library just on Saturday! It’s a beautiful book and wonderful story. Our boys love Staake’s “Hello Robots!” and can recite the refrain of the story. I love Bob Staake’s style. One of my favorite board books when our boys were little was his clever ABC book. I think it’s out of print now, but it had such a fun, bright, geometric illustrations. He is good! I thought Bluebird was beautifully drawn but I was so disappointed by the blatant similarities to The Red Balloon. Betsy, you’re right. I had forgotten about The Red Balloon when I first read Bluebird, so I think my unadulterated read was swept up in its own magic. And then that similarity was pointed out to me by a review, and it made me crinkle my nose a little. I don’t know what to do with that thought other than enjoy both stories, one in still frames and one in motion. What do you think? We love “Good Dog, Carl” by Alexandra Day and “Pancakes for Breakfast” by Tomie dePaola, as well as a few others mentioned above. As a word lover, I was a bit stymied by wordless books at first, but my two-year old daughter loves them so much I have learned to love them too. Thanks, everyone, for the suggestions – I’ve added a bunch of titles to our list of books to find at the public library. Tuesday, by David Wiesner is a favorite of mine. We like ‘Where is the cake?’ by The-Tjong Khing. You can follow a different character through the story each time around. My kids (aged 6 and 2) can’t get enough of it!